Now, Let us creat your lifestyle with LUSCREAL 450ml Ultrasonic Essential oil diffuser & Cool Mist Humidifier. LUSCREAL Essential Oil Diffuser can dual-function as both a diffuser and a humidifier, this makes it the ideal choice. Press the "Mist" button, choose the timer from 1H, 2H, 5H or LAST (continuous). Press the "Light" button to turn on the LED light, the color will change automatically. Press the "Light" button again to fix the color. Press the "Light" button again to change color. If you need to turn it off please long press the button for 3 seconds. 2. Please fill in water below the Max line. 3. Before press the "MIST" button, please ensure that you have filled the tank with water. 4. Essential oil CAN NOT be filled without water. 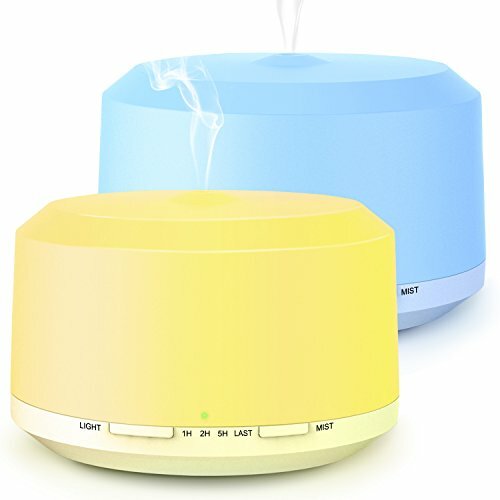 【Safety Certificate and Worry-free Warranty】: Diffuser for essential oils with CE, FCC, ROHS Safety Approval, BPA Free food class material which do not put any harmful chemicals in the air. Our aromatherapy diffuser sold with 30-Day Money Back Guarantee and 90-Day limited product warranty, Order Without Worries! If you have any questions about this product by Luscreal, contact us by completing and submitting the form below. If you are looking for a specif part number, please include it with your message.